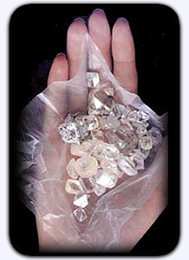 The discovery of diamonds in South Africa in the 19th century led to the worldwide distribution of diamond gemstones. Rough diamonds mined in countries as diverse as South Africa, Russia and Brazil are polished by highly trained and skilled craftsmen into the polished gem we call the brilliant cut. This 58 facet cut is available in shapes such as round, emerald cut, princess cut, pear, marquise, oval and others. It is designed to maximize the return of light to the eye so that the brilliance or “fire” of a diamond is shown at its very best. Polishing and fashioning the rough diamond into a beautifully made gemstone is the cutter’s art. Because diamond is the hardest substance known to man, it demands special cutting and polishing skills. Its hardness allows a diamond to take a unique, very high polish on each facet. Together with correct proportions, these attributes elevate diamonds above all other stones; its superior brilliance sets it apart.